U.S. Education Secretary Betsy DeVos returned to Capitol Hill on Wednesday, making the case for increasing funding for charter schools and education choice — issues close to the West Michigan native’s heart. 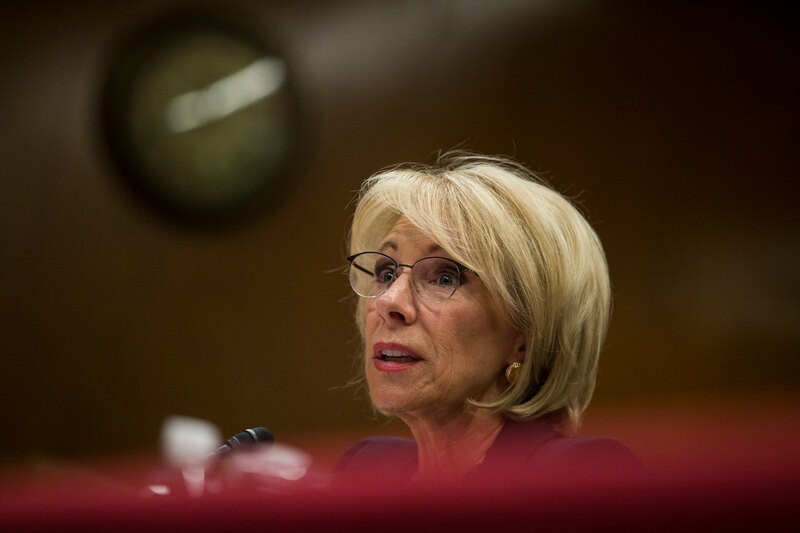 DeVos has testified before several U.S. House panels since March, with majority Democrats zeroing in on the fiscal year 2020 budget that eliminated Special Olympics funding. After considerable criticism, President Trump said he would not cut money for the nonprofit. Freshman U.S. Rep. Haley Stevens (D-Rochester) told the Advance last month that DeVos has advocated for policies that have “fail[ed] our public schools and our students.” She grilled DeVos on charters on Wednesday just before the U.S. House Education and Labor Committee hearing adjourned. In a more than four-hour hearing, DeVos also defended her department’s decision to end protections for transgender students in one of the more heated moments. Under DeVos, the U.S. Education Department rolled back former President Obama-era guidelines extending Title IX benefits for transgender students, which, among other things, allowed them to use the bathroom of their choice. U.S. Rep. Suzanne Bonamici (D-Ore.) asked DeVos if she knew the harms to kids in scrapping those rules — and DeVos said she did. “Did you know that the stress of harassment and discrimination can lead to lower attendance and grades, as well as depression and anxiety for transgender students?” Bonamici said. DeVos initially demurred, but the congresswoman pressed her for an answer. “I do know that. But I will say again that [the Office for Civil Rights] is committed to ensuring that all students have access to their education free from discrimination,” DeVos said. However, DeVos said she didn’t recall the department rescinding Obama-era guidelines for schools and universities to factor in race in their attempts to diversify campuses. Prior to her time as Education secretary, DeVos was a generous donor to Republican candidates and education choice causes, both in Michigan and across the country. In her opening statement, DeVos stressed education choice initiatives. She noted the U.S. Department of Education wants to cut $8.5 billion and eliminate 29 programs in its next budget. Stevens asked DeVos about charter schools at the end of the hearing, citing a study that showed waste, fraud and abuse in programs. DeVos said the study was biased, adding that there are long wait lists for charters. Stevens noted that about 20 percent of her Southeast Michigan district covering Wayne and Oakland counties is composed of people younger than 18. Earlier in the hearing, U.S. Rep. Virginia Foxx (R-N.C.), the ranking GOP member on the committee, complimented DeVos for her posture during the often-combative exchanges. “You’ve done a fantastic job trying to educate our members on the facts of things today and I appreciate that,” said Foxx.